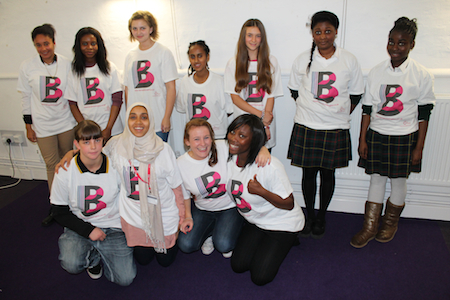 The B Project is pleased to welcome 8 new Peer Leaders aged 15-20 to the team this autumn – Nicola, Jowie, Morgan, Bethlehem, Kiri, Skye, Hermine (all pictured in the back row above left to right) and Arjeta (not pictured), join Lucy, Abira, Lyndsey, Lamar, (pictured left to right front row) Desara and Chloe (not pictured). The new team of 14 young women will be developing and co-producing new an exciting projects and initiatives for young women aged 13-19 in Islington this Autumn and Spring. More info coming soon!